Percy Shelley (1792-1822) was, along with Lord Byron and John Keats, one of the second-generation Romantic poets who followed Wordsworth and Coleridge – and, to an extent, diverged from them, having slightly different ideas of Romanticism. ‘The Flower That Smiles Today’, sometimes titled ‘Mutability’ (though Shelley, confusingly, wrote another poem called ‘Mutability’) is one of Shelley’s most widely anthologised poems, so we thought we’d share it here, along with a brief analysis of its language and meaning. που δεν έχουν ακόμα πεθάνει. Το ίδιο κι ο τρίτος κι ο τέταρτος. Κι ο πέμπτος κι ο έκτος κι ο έβδομος. Ένας σ’ εφτά θώρακες μέσα. Ένας μ’ εφτά ζώνες ζωσμένος. Manolis (Emmanuel Aligizakis) is a Greek-Canadian poet and author who is one of the most prolific writers of the Greek diaspora. Born in the village of Kolibari on the island of Crete in 1947, he moved with his family at a young age to Thessaloniki and then to Athens, where he received his Bachelor of Arts in Political Sciences from the Panteion University of Athens. After graduation, he served in the armed forces for two years and then emigrated to Vancouver in 1973, where he was employed as an iron worker, train laborer, taxi driver, and stock broker. Later he studied English Literature at Simon Fraser University. He was recently appointed an honorary instructor and fellow of the International Arts Academy and awarded a Master’s for the Arts in Literature. He is recognized for his ability to convey images and thoughts in a rich and evocative language that resonates deeply within the reader. He has written three novels and numerous collections of poetry. His articles, poems, and short stories in both Greek and English have appeared in various magazines and newspapers in Canada, United States, Sweden, Hungary, Slovakia, Romania, Australia, Jordan, Serbia, and Greece. His poetry has been translated into Spanish, Romanian, Swedish, German, Hungarian, Arabic, Turkish, Serbian, and Russian. He now lives in White Rock, Canada, where he spends his time writing, gardening, traveling, and heading Libros Libertad, an unorthodox and independent publishing company which he founded in 2006 with the mission of publishing exceptional literature. His translation George Seferis-Collected Poems was shortlisted for the Greek National Literary Awards, the highest literary recognition of Greece. Bill Wolak: Who were the first poets that you enjoyed reading? Manolis: The first poetry I read as a youngster included Odysseus Elytis’ Axion Esti, Yannis Ritsos’s Romiosini, and “Epitaphios,” George Seferis’ “Epiphany ’37” and “Stratis Thalassinos,’ Constantine Cavafy’s “Ithaka” and “The City.” These poems helped me a lot to understand contemporary Greek poetry. 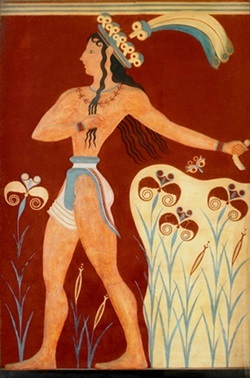 Even earlier than those, I remember reading poems by Solomos and Valaoritis, both poets belonged to the Heptanesean School of Poetry, which represented the beginning of the modern Greek poetry. BW: When did you begin writing poetry? few poems before that. In fact, I believe I wrote my first poem 35 years ago when I was in my early thirties. BW: How do you go about writing a poem? Do you write directly on the computer? Or do you begin with pen and paper? M: I write as it comes, and the circumstances dictate how to do it. I’ve written poetic images on restaurant napkins, on toilet paper, and on the paper towels we used to clean our hands with at work. In my youth, I wrote everything by hand with pen and paper before I would put it in the computer. These days, I find the computer as easy and as practical as anything else. BW: Do you write you poems all at once, or do you work on them a little at a time? M: I write them as they “appear.” Sometimes I write a few poems together; sometimes one at a time, and there are times that I’m so much infused with a theme that I write on continued basis completing a whole book in a matter of days. That was certainly the case with my poetry book Ubermensch that I wrote in eleven days: all sixty-six poems of it, handwritten day after day, six per day, you could say, until I had the first draft of this book completed. That is how much I was inspired with the metaphysical theme of that book. Also, my latest book The Second Advent of Zeus was completed in a similar fashion, although I re-wrote this book twice, until I was pleased with the outcome. BW: Do you keep a journal or a notebook? M: No, I’ve never kept a journal, but I keep various files on which I work on a regular basis; I work on several poetry books at the same time, you could say, and I keep on adding until I have the length of book I consider enough to polish and finalize before I show it to my poetry publisher. I never get stuck on any book, since I keep a few going at the same time, and it is always a matter of time before one of those files is complete as a first draft. BW: You are a bilingual poet, whose poems appear in both Greek and English when they are published. Do you tend to write mostly in Greek, English, or a mixture of both languages? M: I write the images as they come to mind. When my mind is in a Greek mode, for example, I listen to a song in Greek and an image comes to mind, an image that emanated from the lyrics of the Greek verses in that song, I write that in Greek. If, on the contrary, I’m in an English mode and an image appears, I write it in English. When I have a poem in Greek and I try to write it in English, almost every time I add something extra to it, or I delete something from the original that doesn’t seem right. If I go back and forth from one language to the other, soon enough I have a version of the poem that I like in both languages. Then I know the poem is good enough, and I leave it alone for a while. I usually go at them again before I send the draft to the publisher, and sometimes I get his opinion for further editorial work. BW: You also translate Greek poetry. Which poets have you translated? Why have you selected those particular poets to translate? What draws you to them? BW: You are also a poet-publisher. Can you explain how Libros Libertad got started? Spent my own funds. I have never received any financial assistance from any of the federal on provincial programs and I do this for the well-being of the world. Rarely does a book cover its expanses through sales of copies; in fact, I make all Libros Libertad books available on Amazon, although I lose money on every single one sold there. However, it exposes my authors to the entire world, and for this reason alone I insist on making my books available. In general terms, this is my contribution to improving life on earth. BW: You vacation every year on Crete. What draws you back there? M: What draws me back to my roots is the nostalgia that every émigré feels when away from the sacred soil of their childhoods. It’s an emotional reverence that connects oneself (the émigré) with the place of birth. The images of their schooling, the things they were taught, traditions, celebrations, history, all these and many more are the forces which create that pull back to the motherland. I, more so than many others, could say that I feel connected with the intellectual, literary, creative Greece, that indisputable creativity of the Greek spirit, which I serve in my humble way in the foreign land I have lived for the last forty-three years. Sometimes emotions such as these are difficult to put in words, yet they are also very easily discerned and understood by all. BW: When you are not writing and publishing, what kind of books do you enjoy reading? M: Primarily, I enjoy literature, although I also have developed an inclination to read philosophical works, and I most times have one next to me. Of course, one may ask: how can you read a philosophical book while the TV is on or while you aren’t secluded in a quiet place so you can enjoy such depth of thought that demands an analytical mind in full alert? It is as easy as anything else. One simply detaches from all influences at the time, and one reads, despite the content of the book. And I do so. BW: Most of the Greek poets that you have translated write in free verse. Cavafy, on the other hand, sometimes uses meter and rhyme. When you translate Cavafy, do you try to employ meter and rhyme in your English translations? M: I always translate in free verse, even when I translate a poem written in meter and rhyme because it is simply impossible to succeed in reproducing the form without losing on the substance. I strongly believe that the translator has to have the freedom to choose the way he or she feels is the proper way to convey in the second language the images and implied messages of the original work. Otherwise, he or she may run into the serious trouble by writing a piece which doesn’t truly belong to either side of the two cosmoses between which he or she alternates. One can’t write a poem in English from the original Greek without being in a clear English mental state and vice versa. When the two modes mingle and mix, the translation is unsuccessful. BW: Your latest volume of poetry is entitled The Second Advent of Zeus. In general, what role does Greek mythology play in your poetry? M: Greek mythology is an integral part of my work, whether poetry or prose. Fortunately, I’ve been molded in that culture in a seamless way to the point that mythological images and traces of ancient grandeur are abundant in my work. The messages of the myths are interwoven in my poetry in a unique way, characteristic to most poets, and evidently to my work. BW: Why do you prefer to be known as a poet by only by the familiar form your first name Manolis, instead of Manolis Aligizakis or Emmanuel Aligizakis? M: I chose the simple Manolis for two reasons. There are a few quite successful Greeks who are globally known only with their first name. The second reason is that the common name Manolis, instead of my formal Emmanuel, is truly Cretan, a very common name in the island. Once, I remember, my wife and I were at the Chania Public Market. She was inside a kiosk selecting an item, and I stood by the entrance perusing the commotion of the people going and coming. When she needed my assistance and called my name, Manolis, half a dozen men turned their heads towards her, which made her feel embarrassed. It proves the point of how many men are named Manolis in Crete. On the other hand, Manolis is purely a Cretan name, whereas Emmanuel is Hebrew, and I’m a Cretan. BW: At the age of eleven, you transcribed the nearly 500 year old romantic poem Erotokritos. How long is that poem? What made you want to transcribe that particular poem? Why have you released a limited edition of that original transcription? How was it reproduced? nine months to transcribe the work, which took me away from my playing. However, I enjoyed the whole process. In 2004 when on holidays in Crete, I re-discovered my transcribed Erotokritos in my bookcase where all my academic books were collecting dust. I took it to Canada and pondered what to do with it. After consulting various people and experts in the field, I decided to reproduce the book in a collectible, limited edition of 100 numbered, signed, copies. The book designer of my publishing company put it together. It is a hardbound book, a special book, one of a kind, the only longhand book of this kind in the world. It is available for eclectic collectors at the price of $5,000.00 per copy. BW: Which, if any, English speaking poets have had the most influence on your writing? M: I’ve read quite a few, but a couple of them I can point out as they represent a serious influence on my writing. These two are T. S. Eliot and Seamus Heaney. BW: Do you have any favorite Canadian poets? M: Yes, I truly enjoy the poetry of Patrick Lane, an icon in the Canadian poetry scene, and others such as Lorna Crozier, George Bowering, Don McKay, Fred Wah, and Jamie Reid, who was also a good friend. BW: Who are your favorite novelists? Alexandros Papadiamantis to name a few. From World Literature, I enjoy Victor Hugo, Fyodor Dostoevsky, Jules Verne, Alexander Dumas, James Joyce, William Faulkner, Henry James and many others. BW: You are a poet, a novelist, and a writer of short stories. When you begin writing, how do you know if the work is a poem, a short story, or a novel? M: It all starts with the first concept and it develops as the process begins. Of course, one doesn’t write a four hundred page novel starting with four verses of a poem. The concept of the poem is different from a novel that needs a plot, many characters, their development, and twists and turns. Usually a poem doesn’t have these elements. BW: How do you go about writing your novels? Do you write a scene a day? Do you have an intricate plan before you begin writing, or do you allow the plot to develop as you write? M: It all starts with the first concept; I usually have a certain plan that I want to follow, a central idea of what the book will be, and once I start, I make sure I keep a certain discipline. For example, I try to write two to three pages daily until I have the whole story developed and all the subjects covered. However, when I start with the first lines, I know that it’ll take its form bit by bit and page after page. And when the writing transforms into a novel, a basic storyline is in place up front, what I call the spine of the novel. Then the story develops incrementally. There are times when the plot takes turns and twists which were never contemplated beforehand, although at the end they become a very important part of the whole work. An example of the discipline I mentioned earlier is this: when I wrote my last novel The Quest, which is not published yet, I started with the idea of writing a novel of about 200 to 250 pages. I had a basic structure in my mind, and I committed to write between 2 and 3 pages daily. In 3 and an half months, I had written the first draft of a 234 page novel. BW: So far, what do you consider the most satisfying or fulfilling books that you have written? M: I’m very satisfied with my novel The Quest, but I also enjoyed my two poetry books Ubermensch and Chthonian Bodies. The second title refers to a combination of my poetry and the pictures of paintings of a good friend-painter Ken Kirkby, of whose paintings my poems speak. It is a unique book, just like my Ubermensch.